UNITED NATIONS, Jun 6 2013 (IPS) - When the United Nations launched its Millennium Development Goals (MDGs) back in 2001, two of its primary objectives were to halve extreme poverty and hunger by 2015 and promote gender empowerment worldwide. But the links between the two remain unhinged, warns Danielle Nierenberg, co-founder of Food Tank, a food think tank “focused on feeding the world better”. She pointed out that women make up at least 43 percent of the global labour force working in agriculture; and in some countries in sub-Saharan Africa, women make up 80 percent of all farmers. 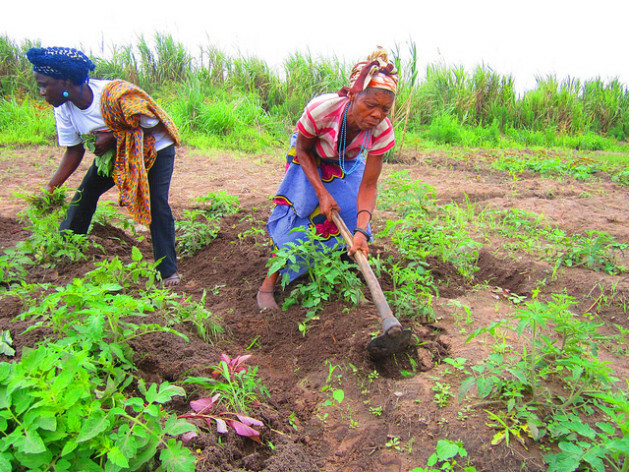 “Unfortunately, women typically lack access to land, credit, markets, inputs, education, and extension services, making their role in food production much harder than it has to be,” she said. Nierenberg said recent findings from the Food and Agriculture Organisation (FAO) suggest that if women had the same access to productive resources as men, yields would increase by 20-30 percent, helping raise agricultural output in developing countries and reducing the number of hungry people in the world by 12-17 percent. “The MDGs on gender equity and food security need to be more intertwined because we can’t have one without the other,” she said. “I hope when the new set of Sustainable Development Goals (under the U.N.’s post-2015 development agenda) are announced, food security will also include women’s empowerment,” said Nierenberg, who is an expert on issues relating to sustainable agriculture and food. Asked about the upcoming 38th FAO sessions in Rome Jun. 15-22, she said, “I think it’s extremely relevant. I know FAO has made huge efforts to put a gender lens on many of its projects, while I don’t see women farmers specifically mentioned in the agenda. “I think they would be remiss in not discussing the importance of women in agriculture,” she added. Among the substantive policy matters to be discussed at the upcoming conference is FAO’s gender policy and the U.N. system-wide Action Plan on Gender Equality and Women’s Empowerment (SWAP). Launching FAO’s flagship annual report Tuesday, Director-General Jose Graziano da Silva said while the world has registered some progress on hunger, there was a still a long way to go. “FAO’s message is that we must strive for nothing less than the eradication of hunger and malnutrition,” he said. The report points out that while some 870 million people (out of a global population of seven billion) remained hungry in 2010-2012, this was just a fraction of the billions of people whose health, well-being and lives were blighted by malnutrition. The social and economic costs of malnutrition are “unconscionably high”, amounting to perhaps 3.5 trillion dollars per year, or 500 dollars per person globally, says the FAO director-general. In a report to the Human Rights Council last December, Olivier De Schutter, U.N. Special Rapporteur on the Right to Food, underlined the range of human rights instruments, including the International Covenant on Economic, Social and Cultural Rights, which guaranteed the right to food “without discrimination”. But despite these requirements, he noted, discrimination against women remains pervasive in all spheres of life, resulting from laws that are themselves discriminatory. The report singled out unequal access to productive resources such as land and to economic opportunities such as decent wage employment; unequal bargaining position within the household; gendered division of labour within households; and women’s marginalisation from decision-making spheres at all levels. “A successful strategy for strengthening the rights of women in support of the realization of the right to food requires a whole-of-government approach, coordinated across various ministries, including those responsible for health, education, employment, social affairs and agriculture,” the report said. She said De Schutter has clearly outlined how lack of women’s empowerment is directly related to food insecurity. “Improving food security and women’s rights have to go hand in hand to make sure that women, children, men, and whole communities and countries are well-nourished and improving their incomes,” Nierenberg said. She said women are the key to food security and investing in their role as food producers and providers of food will be crucial to helping reduce hunger and improving nutrition. “And we need to recognise women’s multiple roles – not just as producers and providers, but that they’re also business women who need to make a fair wage, they’re innovators sharing their knowledge with others in their communities, and they’re stewards of the land who deserve to be recognised for the ecosystem services they provide that have long-ranging benefits,” she added.